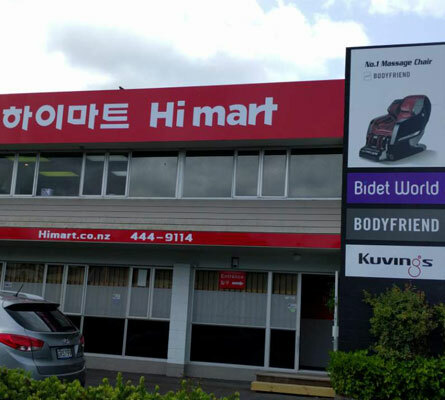 Save Zone Ltd. T/A Himart is New Zealand’s leading Korean retailer that imports and sells electronics and appliances from Korea since 1998. We are proud to offer customers high quality products and superior services with the widest possible range of branded technology and appliances. We especially focus on products such as massage chair, slow juicer, bidet and kitchen appliances at an unbeatable price to make customer’s life easier, comfortable, and valuable. We have earned good reputations and trust from our customers based on our product’s quality and honest services. In other words, we have gone the extra mile to help customers with their technology and appliance purchases. Our service team dedicated to providing on site based tech expertise, and delivered the best assistance to customers. We also service small, medium to large business clients. Our dedicated managers provide competitive purchasing and relationship benefits. We’ve been supplying our products to various clients and developed a strong and long lasting relationship with them. We have the biggest geographic coverage in New Zealand, enabling us to satisfy the requirements of more customers and clients than any other companies. Our goal is to increase the credibility of our products and services and have a close relationship with our customers and clients by making persistent efforts. We will keep it that way. If you need any assistance please do not hesitate to contact us at any time through Headquarter in North Shore or Flat Bush Branch in East Auckland.